This landscape construction work was a revamp of existing planting and garden beds. The client wanted a new Sandstone look with raised garden beds,lighting, paving and instant screening. See below gallery for more details and pictures. This was a really nice out come for a difficult site. We needed to curve the wall and interlock the posts for the screening inside the wall for it to be secure and strong, more importantly look GREAT. Brand new over haul of the existing area, new retaining wall, feature steps leading down to a new deck with surrounding pool fencing. See below for more details and pictures. Modern finish to a lovely home in Petrie. The homeowner new what he wanted and this project turned out brilliant with the new Limestone pavers, aluminium pool fencing and Bali hut patio. Beautiful pool renovation. It needed an overdue update and using the Off White Limestone made the area nice and inviting. See below for pics during the project. Brand new home deserves brand new landscaping and an exposed concrete driveway. No architects drawings for this one. Just a couple of site visits listening to what the client wants, a budget check and here you have it, beautiful. This job grew and grew. The client loved having us on site and doing the work so they gave us more. 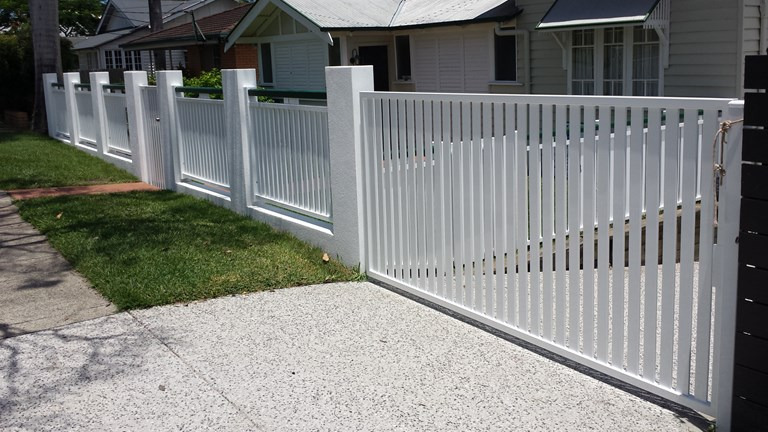 New driveway, carport, feature fencing with swinging gate and paving. This Versa Block retaining wall and Aluminium Slat fencing was tricky to quote on and even more tricky to build by us at Landscape Renovations due to the slope of the site and access. You can see in the pictures that the materials had to be crane trucked up onto a platform on the ground so we could get at it comfortably with wheelbarrows etc. 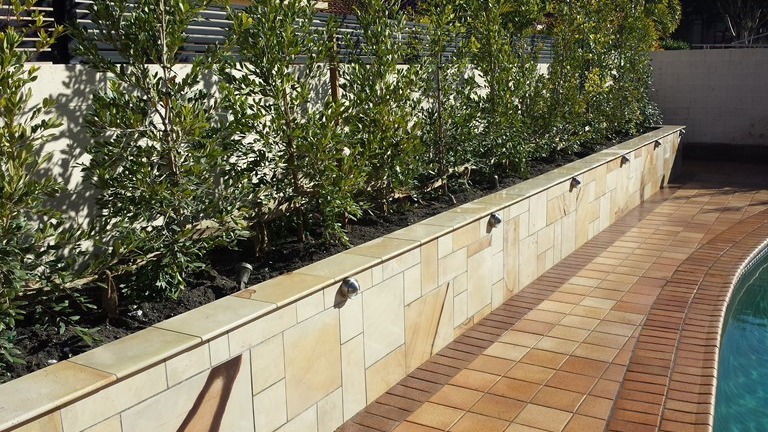 What a massive upgrade from your bushy pool surrounds to the best available premium Sandstone from Toowoomba quarries. We excavated out the trees and built reinforced block walls on concrete footings, water proofed the back of them, installed drainage, soil and Aussie Boomers. The Sandstone was cut into 3 different sizes and stuck on like tiles. The cappers and lighting set the job off. This mix of masonry (concrete) link blocks, aluminium pool fencing, natural stone tiles (sandstone steps) and timber decking always looks amazing together. The 100x100 hardwood posts is a nice feature on the deck. Pool renovations can be really challenging especially if your access is tight, no room for delivery's and there are plenty of steps or landings to navigate your wheelbarrow over. Luckily for us this wasn't one of those jobs. It was a difficult job though but that's what we specialise in, getting it done and making sure the client is more than happy. Structural landscaping is in our opinion one of the best trades if you have a flair for design, practicality and innovation. Many times yu need to think on your feet and come up with quick effective solutions/ideas when quoting and doing the work especially a large job with no drawings or plans. "Landscape Renovations is your one stop shop for almost anything out side of the home" thats what I told these lovely clients at Clayfield and we ended up working there for about 2 months solid. Even managed a low voltage swinging aluminium gate to finish it all off.